Suddenly winter is upon us and while I've been relegated to the bench with tennis or golf elbow (although I play neither), I've missed the opportunity to stock up on cosy knits. Before I was sidelined, I had become a bit disheartened with a number of the projects I’d started and ended up doing quite a bit of unraveling which didn't help my elbow at all. One of those was my Willow, which was a complete fail (yes, pride did go before a fall, grrr!). The angora mix blue yarn was too soft for the pure wool variegated yarn, so the yarn is back in cupboard waiting for another project. 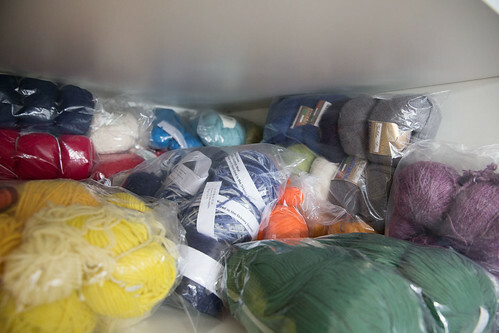 Speaking of cupboards...do you think I have enough yarn? Figure 1 Yep, I bought all of that! So I’m turning my attention to that most difficult of tasks for a knitter, stash busting. The problem with stash busting is that you’re trying to find a pattern to fit the yarn and not the yarn to go with the pattern. This may just sound like grammatical gymnastics, but think of it this way. 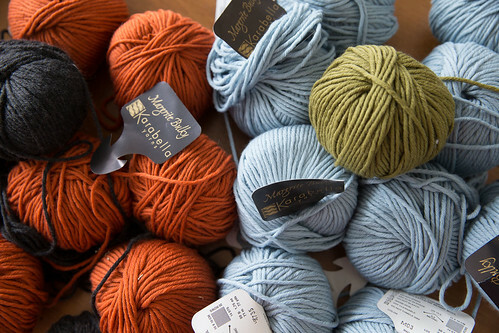 If you find a pattern you like, you get it and find the perfect yarn in the right amount. When you are trying to use stashed yarn, you are trying to find the pattern that most efficiently uses up as much as possible of your stashed yarn so that you’re not left with an even more unusable odds and ends of yarn. As a serial end of dyelot or discontinued yarn shopper, I have a collection of odd colours of yarns often in the above mentioned small unusable quantities. Consider my collection of Karabella Margrite Bulky. I have odd amounts and dyelots and now that one of my favourite online yarn suppliers, kpixie (who always has fantastic end of dye lot bargains available), have ceased to stock Margrite Bulky, I have realised I need to use it up as efficiently as possible. So I’ve divided my stash of Margrite Bulky into three distinct piles based on colour. 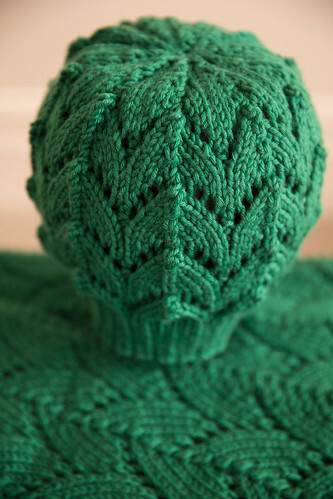 I used up my last two balls of emerald green to make a hat to match my Haven scarf (by Kim Hargreaves from Heartfelt). The pattern is also by Kim Hargreaves, ‘Moon’ from Cherished) and is easy, peasy! ‘Moon’ only takes an hour or so to knit and used up my two balls exactly. I've lumped the remaining blue and olive green together in one pile and the orange and gray in another. I didn't have enough in either pile to make a garment of any real size other than more scarves and hats, but really, how many Margrite Bulky scarves and hats do you need at once? 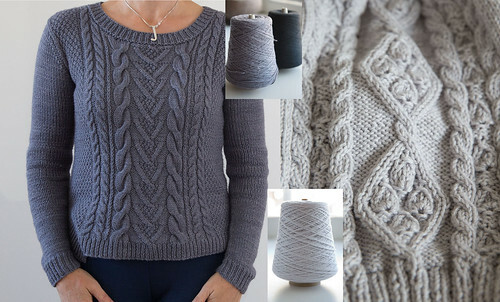 My solution was to buy MORE blue yarn from another Raveler and now of course it won’t fit in the cupboard, so I’m already half way through a bottom up version of Melissa LaBarre’s Agnes, a pattern I love, using as a base one of the jumpers from the Patons Stella Book 8009. 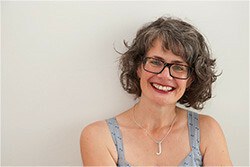 Why, I hear you asking, don’t I just buy the pattern for ‘Agnes’, it costs less and supports independent designers? Well, I’m just not a fan of the fit of top down knits, particularly with raglan sleeves. All I can see is that bunch of excess material under the arms you see with many top down knits, particularly on women with busts, and raglan sleeves are the enemy of the broad shouldered. So also are bulky polo necks, so I won’t be knitting that version! And heaven knows while I’m not a fan of sewing up, I do feel that seams in knitting work just the way they do in sewing; that is, seams create shape and hold the pattern together. I am even planning on putting in the pockets (I put pockets in pajamas and leggings; you've got to have somewhere to put your hanky) which allows me to use up some very old Louisa Harding Grace Silk and Wool that has been lurking for years and years in my odds and ends box; a large box which once contained a wedding present and now contains oddments of yarn normally reserved for knitting brooches for the church fair and the like, and which is exactly the same olive green as the Margrite Bulky. Got to love a plan that uses three stashed yarns! I have already made some progress on my stash, using two cones of yarn I have had around for quite a few years also. Figure 5 Two projects using JaggerSpun Zephyr Wool-Silk DK, on the left ‘Cable Jumper’ from Cleckheaton 3005 Aran Knits and on the right a failed attempt at Sarah Hatton’s ‘Affection’ from Rowan Knitting and Crochet Magazine 50. The cable jumper is a hit! I'm really happy with the pattern (surprisingly easy) and it is a dream to wear. JaggerSpun Zephyr Wool-Silk is my absolute favourite yarn, it comes in a great range of colours on cones with great length. When I knit it on 4mm needles I get a worsted/aran 10 ply tension, and after it is washed you have a lovely soft fabric that is light and yet cosy. Even better the pattern used up all of the cone and I had only a few ends to darn in, always a bonus. My Affection was less successful because I didn't listen to my own advice. Raglan sleeves do not work on the broad shouldered who have a bust. It was so ugly that I sat down immediately and instead of eating lunch unraveled it down to the underarms. For the moment it is back in the to-do basket as I love the cable pattern on the front and I think that I can use the Cleckheaton pattern to finish it off with set-in sleeves. I don’t have a full cone of this (I used a bit on my Frankie, an old fave), so I'm not sure how long the sleeves will be.